The Amy Gillett Foundation has today announced its support of Transport for NSW’s #SeeYouSoon holiday road safety campaign that uses Twitter-linked digital billboards and the social media voices of everyday people to encourage loved ones to drive safe these summer holidays. 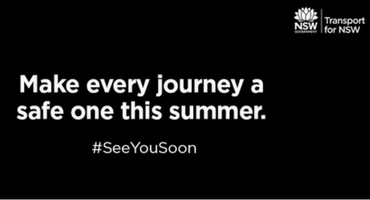 Using the hashtag #SeeYouSoon, messages from the public will be displayed across a network of digital billboards, on social media, online and in-stations across the state for drivers and commuters to see on their journey. This year alone, 375 lives have been lost on the states roads, 39 more than the same period last year – mothers, fathers, friends and loved ones who never made it home for Christmas. The #SeeYouSoon campaign will focus on something just as impactful as those numbers – the emotional connection between holiday travellers, their friends and families. The innovative approach will remind people not to be complacent before setting off and to celebrate every safe journey this summer. CEO of The Amy Gillett Foundation, Phoebe Dunn is 100% behind the campaign. NSW Centre for Road Safety Executive Director Bernard Carlon said too many lives have been lost on NSW roads this year and reminded everyone that they should never underestimate their ability to change people’s behaviours. The campaign was launched on Monday 19 December by road safety ambassadors including The Wiggles, Australian cricketer Peter Nevill, Jarred Tyson of the Western Sydney Wanderers and players from the Sydney Swans and the Greater Western Sydney Giants. The #SeeYouSoon campaign forms part of NSW Government’s commitment to bringing the road toll closer Towards Zero. Those wishing to participate are being encouraged to tweet a message to their loved ones at home or before they get in the car using the hashtag #SeeYouSoon, as a promise and reminder to drive safely. So, what’s your message to friends and family on the road this holiday season? Make every journey a safe one this summer.